Stephen Wilkerson lost 41 lbs. 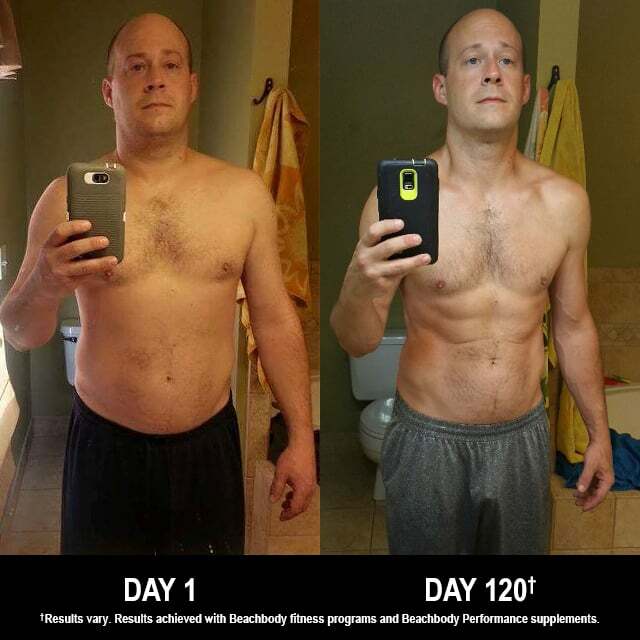 in 120 days with INSANITY MAX:30 and the Beachbody Performance supplements. He entered his results into the Beachbody Challenge, and won the $500 Daily Prize for October 14th! I am a generally happy person but was unhappy with my current state of health. I was 38 years old and just didnt feel like i thought i should. I felt the need to make a real change in diet and exercise. My family and my children. Seeing them grow up made me want to be as healthy as I could, so I can hopefully be around a little bit longer to share life with them. My diet and the motivation to put in the work necessary to get to where I wanted to be physically and mentally. Shaun T is a powerful motivator, and he’s the best trainer. If he can’t get you going, I don’t know what can, and once you start seeing the results, it just takes off from there. INSANITY MAX:30 pushes you to your max, no pun intended. It tests you mentally as well as physically. If forces you to become a stronger person on the inside and out. I am just proud of myself for finishing the program twice through. The changes I have made and the circumstances I have overcome lead me to believe that we are capable of anything. I feel I am more confident in every day life. I certainly have more energy than I have had in quite some time. I feel good when I see my kids watching me workout. I feel as if that is setting a good example for them down the road. I am lucky to be in the best challenge group out there. My FITFAMILY is always there to support and motivate one another. We keep each other accountable daily and it truly helps when your just getting started on this journey. Blakely Dunn is my coach and she is just awesome. Always there to help you in any way or even to just lend an ear. She may even occasionally invite you into the garage of pain to try out new programs. We are all lucky to have such a strong coach in our group. I used Shakeology to keep me full. I also used Energize for the pre-workout.